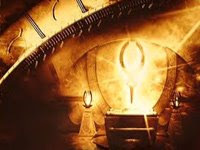 Stargate SG-1 fans in the United Kingdom won't have to wait quite as long to see Stargate: The Ark of Truth, the DVD movie that promises to wrap up the Ori storyline from the past two seasons of the television series. Sky One will premiere the movie on Wednesday, March 26 at 8 p.m. -- just two weeks after the movie's U.S. DVD release. The film then arrives on DVD in the U.K. on April 14. The Ark of Truth stars SG-1's Ben Browder, Michael Shanks, Amanda Tapping, Christopher Judge, Claudia Black, and Beau Bridges in a story that spans the galaxies. With our own galaxy under seige by the armies of the Ori -- powerful ascended beings who demand worship from "lower" life forms -- SG-1 must take the Odyssey through the Supergate into the enemy's own territory. There they hope to find a device created by the Ancients millennia ago, which they hope will stop the Ori worshipers from killing millions of innocents. On the other side, they get far more than they bargained for. Stargate: The Ark of Truth makes its U.S. debut on DVD on Tuesday, March 11. Order now at Amazon.com, and visit GateWorld Play for preview videos of the movie every week. Also, don't miss GateWorld's early review of the movie next week! No television broadcast in the United States has been announced yet.